Warning: The following work contains descriptive material and scenes of explicit sexual encounters between male and female adults. While not erotica per se, it is intended for adult readers only. 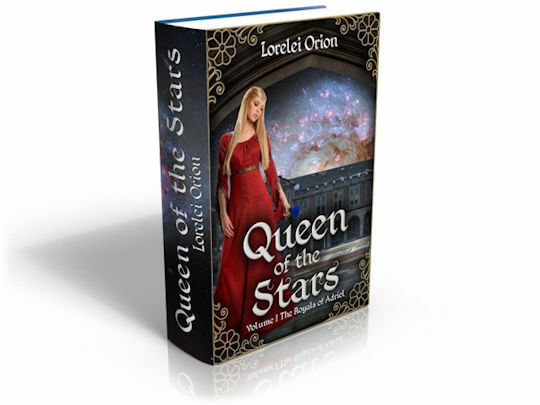 This excerpt from Queen of the Stars is after Sarra captures Raine, making him her prisoner. But, who will be the victor...? Raine roused, guessing that he still lived since he felt pain. He ignored the throbbing in his head and cheek and braved the light, lifting his heavy eyelids. He was on his back on a bunk, his arms spread out above him with his wrists handcuffed and tied to the cables. Suddenly feeling defenseless, he yanked forcefully on the ties. He made certain that his fury was on his face when he finally looked at her. His breath caught. The princess sat within the chair in the main cabin, mocking him with her brilliant, dark-blue eyes. She wore the red gown—the one from his travel bag—seeming like she was aflame. Her golden hair spilled about her, and she was at ease with one leg curled up beneath her, the other bent and showing a tempting calf and foot. She dangled her arm over her knee, and in her hand was his weapon. Slowly, she glanced back and forth from the M-5 to him, and each time she met his gaze she was a bit more pleased with herself. Raine suppressed an infuriated sound and turned away from her stunning beauty. Truly, the woman was incorrigible. She laughed smoothly, but he didn’t acknowledge her, even when she came to stand before him, filling his nose with her unique blue rose scent. “Execution, is it?” he rasped. “You did,” he said, flatly. Raine took the challenge. She was at the foot of the bed, standing akimbo. She raised a golden eyebrow and airily tossed back her hair, and on her crimson lips was a chilling smile, one so out of place on such a beautiful face. His eyes widened as she seductively ran the weapon down the front of the luminous, flame-hued dress, stopping at the hip. Her décolleté threatened to spill her full breasts free, putting him in a dangerous position. His desire stirred, even while she pointed the M-5 at him. “So, what’s it like to be afraid?” she asked, closing one eye and aiming at his breast. “My greatest fear is the loveliness of my captor. Come to me,” he crooned. Raine clenched his fists while she moved for the bridge’s door. Before disappearing beyond it, she added insult to his injury by blowing him a saucy kiss. Sarra tossed the gun carelessly onto the command chair. She stalked to and fro around the bridge, miffed at him for showing no cowardice. There had been contempt and lust in his expressions, but not the tiniest trace of worry. What would it take to make him admit defeat? Simply, she would have to be strong. She was the princess royal and she had her responsibilities. He was her prisoner now and she would treat him as such. But, she couldn’t leave him like that all the way to Adriel! © LoreleiOrion.com. | All Rights Reserved.